If you are a newcomer to river salmon fishing, you ought to know how to fish the middle of a salmon pool - the section of a river where the water steadies between rapids. 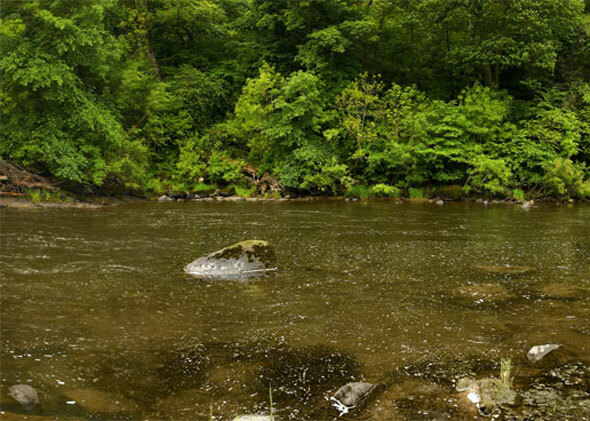 The pressure will be on for you to catch from these excellent salmon spots, so it pays to know exactly where you'll find the fish, where to cast and what to do so you get the most from them. This was the taking spot at this height of water. The day we visited this pool we had a little overnight rain that by lunchtime had caused a slight rise. The water rose only an inch but more significantly added a tinge of colour. This instantly brought the fish “on the take”. Any such changes – however small – should be closely observed and reacted to. On this occasion a change to a brighter fly (the gillie’s size 12 Cascade) in view of the colour in the water proved successful. On this pool there are many obstacles – submerged boulders and shelves everywhere. Here it is best to play the fish out in open water until you feel it tiring. Only then should you try to bring it into the shallower, boulder-strewn margins, keeping the rod high to avoid the leader catching on rocks. Pools with a clean gravel bottom and gently shelving shingle margins are a salmon-fisher’s dream. While the water is low, rocks and boulders in the slack water will serve no purpose other than to make wading difficult. However, in high water these features will become important lies for salmon. This will vary, depending on the characteristics of the pool and whether you wish to use a net or beach the fish. If you have someone with you it is significantly easier but, assuming you haven’t, a predetermined plan will avoid unnecessary panic. Look for the bit of water with the clearest bed, preferably with gradually sloping shallows, and make sure you know precisely in which pocket your priest/pliers are. In this age of catch-and-release, fish are fought harder and landed more quickly to avoid unnecessary stress. If returning the fish is your intention, keep it in the water as far as possible, remove the hook with pliers and hold the fish with its head facing the current. Do not let go of it. Only when it is ready will it kick its tail and swim off. If you are to keep the fish, despatch it IMMEDIATELY with a priest – before you’ve taken the hook out. In periods of low water salmon will settle in the deep, sluggish areas of a pool waiting for a change in the weather. In some cases they may stay in a given pool for weeks or even months. You will see them “show” here. Some will be coloured/stale fish that have been in the river for some time. These fish are difficult to tempt, but first or last light offers the best chance if water conditions remain the same.